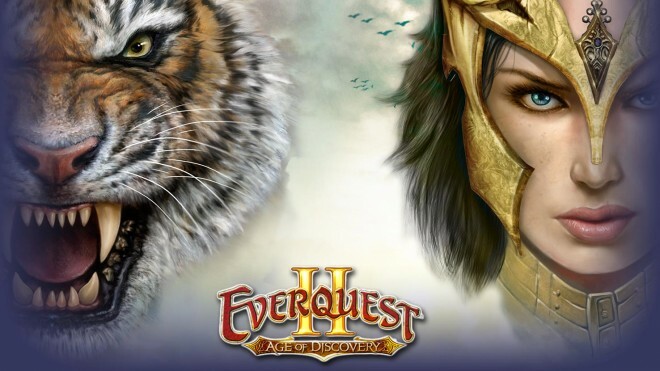 So I wanted an EverQuest II: Age of Discovery wallpaper for my desktop. I change wallpapers often, and thought hey, I’d like to get in the mood. Usually by this point, we’ve received some promotional material for the upcoming expansion, namely high resolution wallpapers, screenshots, etc. Since I haven’t seen hide nor hair of anything like that, I put together my own 16:9 widescreen EverQuest II: Age of Discovery wallpaper using key art provided to Zam. This is an unofficial wallpaper, but if you’d like to adorn your desktop, feel free to download! Thanks for the wallpaper Feldon, on Domino’s Twitter account a EQ2 Press Tour should take place today, hopefully with that more information on Age of Discovery will be made available. That would be Massively, TenTonHammer, MMORPG, and maybe Zam. I have yet to be invited. Cheer up Feldon =) Seriously though If anyone should be there it should be you Feldon. You at least keep the fans up to date unlike SOE. Press Tours have traditionally happened 1-2 weeks before release. Thats not good is it? 1-2 weeks, and I still have not got into beta, cant wait any longer to play as a Beastlord. I visit your news site daily and enjoy your webcast transcripts. Hope you get included on future press tours. Other sites have more readers because they cover more games than just EQ2 but EQ2Wire is the site I visit first for latest EQ2News. SOE is giving one really cool thing to fansites in the near future which I’ve already talked about some and I am certainly looking forward to that. I just hope we don’t get left out of the Age of Discovery loop. Be afraid, cuz you might get something that is broken or bugs out on you. I know SOE’s luck with things. For Cavius there was not much to test in beta. We get up to 50 aa’s and it is prolly just an increase to the ones we have. Dont have to test that. The only thing that really needs testing is DYOD, and Beastlords. They will just leave the DYOD to the live servers to test out when it goes live. With the launch just around the corner, I would really like to know how many aa we are getting. It is as if SOE is not proud of this COUGH xpac at all. Hopefully we will hear something before the xpac actually ships. Pretty sad you had to put together a promotional wallpaper for an expansions that has been said to be near days away, if not weeks. While I appreciate it greatly, I still find it very sad. When SOE does not deliver timely, accurate, or cool info… we can always count on Feldon to throw us a bone 🙂 I literally haven’t looked at any other fan site, eq2players, or any other media source for months at least. Great job bud! Yeah I read eq2wire.com multiple times a day to get the latest info, updates, and info that cuts through any glossy BS. Just the facts jack. I’ve been recommending EQ2Wire to guildies for months now. Without a doubt, anyone who wants to have a clue about what’s going on with EQ2 should be dropping by here daily…and hitting the tip jar too, truth be told! Yes, Yes, 3 CHEERS FOR FELDON!!! :). EQ2Wire is my main site for EQ2 info as well. It eliminates weeding through the forums to try and get inteligent information. One could get very cynical at this point and suggest that the lack of beta invites is to prevent a mass cancellation of pre-orders. Thats what I have been thinking as well, what exactly are they hiding? The last time SmokeJumper posted on the Live Forums was a week ago, he does log in quite alot, but I think he keeps his posting for the beta Forums. And here we are one week away from the original release date for Age of Discovery…..
SoE seems pretty selective on who gets press coverage these days. I miss Kiara, she did a great job of keeping fansites and press in the loop. Don’t feel Bad Feldon, Zanadi and I didn’t get invited to anything this expansion either. Still find it hard to call it an expansion. How about calling it an Expansion priced Adventure pack? The again, teh adventure packs seemingly had more content in them. IMHO in the light of going F2P and the lack of Velious inclusion, they should priced this at 19.95 and maybe make the CE the ‘normal’ price. I bet it would go over like gangbusters with both existing subscribers and the new crowd. Shame on SOE for only inviting the larger fan sites for the press tour, which I assume will only write wonderful things about their product, rather than including the smaller shops that actually have something to say. But that’s probably the point, isn’t it?